Summer permits will be available for purchase online beginning April 1 through MyParking. Summer permits will be valid in the following lots on campus: A2, Flex, and Resident. Summer permits may be purchased by the sessions listed below. Permit and HawkCard gate access will be valid on your registered vehicle(s) as of the permit effective date. No physical permit will be issued for summer permits. Refunds for summer permits may only be requested by the corresponding session Add/Drop Date listed below. Votes have been submitted and a winner has been chosen! Congratulations to Ayesha Anees for winning in both permit design categories. Her winning designs will become the face of the Flex and Spring permit for next academic year! ACaPS would like to thank all the students that participated in this year’s contest. Your hard work and creativity are much appreciated. We look forward to next year’s contest. Parking lot B4, located on the west side of the Kaplan Institute, is now open to be used for visitor parking. Individuals that wish to park in lot B4 must have a valid parking permit. Permits may be purchased from the pay station located on the south end of the lot. For more information regarding visitor options and rates, visit the visitor parking web page. The north end of lot B4 is reserved for gold permit parking. Individuals that wish to purchase a gold permit for this lot may contact the ACaPS office. Individuals parking in these reserved spaces without a valid permit will be cited. Additional electric vehicle charging stations have been placed in lot B4. An electric vehicle policy is under review and will be communicated to the campus community accordingly. Questions may be directed to Access, Card, and Parking Services via email acaps@iit.edu. An authorized supervisor or manager MUST complete an Affiliate ID request form for all new affiliates (Public Safety, Dining Services, Postal Services, Custodial Services) of the university. The form may be emailed to acaps@iit.edu one week prior to the individual arriving to campus or presented on the day the employee comes to the ACaPS office to obtain the HawkCard. 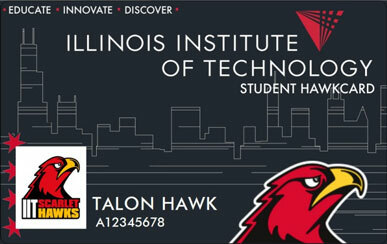 HawkCards WILL NOT be issued to employees without the completed form.